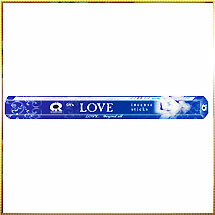 Well, Mystical Series of love incense sticks have been used in different cultures and religions. We believe that the smoke which arises on burning of fall in love incense sticks, carries one's love and prayers to the God. Other purposes burning Mystical incenses sticks are air purification, masking of smells that are unpleasant, providing inner harmony, and many others. Ancient civilizations and almost all the cultures have used Mystical incense in their religious rituals, embalming rites and in honor of their ancestors and this traditional is still on. It is made of seeds, barks, roots, leaves, charcoal, flowers & others. Also, few essential oils, gums, resins and aromatic chemicals.